In this article, we will learn about Directives in AngularJS Application. They allow us to extend HTML with new attributes, elements, and classes, and are used for DOM Manipulation, Data Binding, Loading View, Events firing, etc. In this article, we will learn about Directives in AngularJS Application. Before starting, I suggest you read my previous articles in this series. Some of the directives like ng-view etc. can be used as a custom element. In this article, we will see some built-in AngularJS Directive. In this series, we have already seen some of the Directives like ng-app, ng-model, ng-controller, ng-bind, etc. so, I am not going to cover them again. 1. ng-init: ng-init is used to initialize special properties for ng-repeat directive and for injecting data via server side scripting language in AngularJS application. It is recommended to use controller for initializing a property/model in AngularJS application. 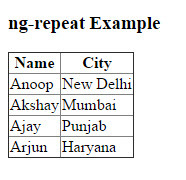 2. ng-repeat: ng-repeat directive repeats HTML elements for each item in a collection. It is very similar to the foreach loop in C# or other programming languages. 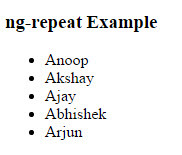 Example: Fetch data from Array of Objects using ng-repeat. 3. ng-show/ng-hide Directive: ng-show/ng-hide directive allow us to show or hide different HTML Element based on the expression passed to that directive. 4. ng-Click: ng-click directive updates the model/property of AngularJS application when an element is clicked. Please visit https://docs.angularjs.org/api/ng/directive for reading more about various built in directive. Hope you liked it. Thanks!